Lunch Club 1 continues to enjoy visiting a range if different restaurants with approximately 20 to 24 members attending each month. We are trying something a little different this month with Brunch at Browns on Park Row. Our initial venue was to be Carluccios but sadly this is closing down this month. Our Christmas meal is again being held at The Victoria in Beeston when 36 members will enjoy an excellent festive meal , together with crackers and a free Raffle!! We have a provisional programme until May 2019 with the exception of April so we would welcome newer members coming forward to organise our April lunch. Glenis and I will be happy to offer any help needed. We would like to wish everyone a very Happy Christmas and look forward to seeing you all, together with new members in the New Year. Lunch Group 1 has now been running since Beeston U3A was formed 7 years ago..We have a steady membership of 50 members and have dined at many different restaurants experiencing different types of food. We are now re visiting many of our favourite restaurants which is fine as the social contact is as important as the venue. We have a full programme of lunches up to and including December but we do find that these are being organised in the main by the same group of volunteers. We are trying to encourage our newer members to organise one of our monthly lunches and will of course give them as much support as they require. We look forward to the continued success of the group and to welcoming new members. Lunch Group 1 continues to enjoy a variety of different venues for our monthly ‘dining ‘ get together. We are repeating our successful early evening meal and afternoon tea again this year. The early evening meal this month is at Cafe Roya and in July we visit Hoggs Bistro in Breaston for afternoon tea. We also have meals booked through to October and will be visiting The Ferry Inn at Wilford Village in June, Ask Italian in Nottingham in August and Marco Pierre White also in Nottingham in September. The group continues to enjoy a variety of venues and different cuisines. We currently have a membership of 52 with an average of 20-25 attending each month. We ended 2016 with a very enjoyable Christmas lunch at Bistro Pierre in Nottingham. We began the New Year with a visit to The Corn Mill in Chilwell where members enjoyed an excellent Golden Years menu and already have some interesting new venues planned, namely the Corinthian Restaurant on Goldsmith Street and The Ferry Inn in Wilford Village. We are also planning a return visit to the Adams Restaurant in the Lace Market. Our main focus for the year is the need to encourage and support our newer members in organising their first meal as the success of the club depends on all members participating. We appreciate it may appear a rather daunting task initially but it really is not that difficult. It entails choosing and booking the venue, collecting bookings and deposits at the Open Meeting prior to the meal and on the day collecting any balances owing and paying the final restaurant bill. Lunch Club One continues to enjoy a varied programme of meals and we would like to thank the volunteers who have organised them this year. We have welcomed several new members recently and the group now stands at 51 with an average of 24 people attending each month. Our new ventures this year have been two early evening meals and an afternoon tea, all of which have been very successful and hopefully will be repeated in 2017. The success of the group depends on all members taking a turn in pairs to organise a meal but we realise that this may seem daunting to new members hence we are looking at setting up a ” buddy ” system to make this easier. We are now looking forward to our Christmas Lunch at Bistro Pierre in Nottingham. This is again being organised by Sheila Bates and Vivienne Morgan who always make it extra special. Dining out with like-minded people continues to be a popular choice for members. In May we veered away from the usual lunch time meal and tried an early evening meal at Latino’s in Chilwell. This was a very successful choice and will be repeated again in September when Linda P and Julie are organising a meal at Roya, the vegetarian restaurant, on Wollaton Road. In June we had lunch at Bennett’s in Long Eaton; most members chose the two course senior citizens lunch, which, at £5.95 was great value for money served by friendly staff in a clean and stylish dining room. July saw the group at Finton’s Bakehouse in Breaston for afternoon tea. Again this proved to be a popular change from lunch as you can see from the photograph. In October Sheila and Linda are organising lunch at Bramcote Hills Golf Club and in November Jose and Jean will be taking us to George’s in Nottingham. The Christmas lunch is always popular and it is hoped that volunteers to organise this event will be announced soon. Do get in touch with myself or Shirley if you would like to take this on or have a favourite restaurant you can recommend to us. Lunch Club 1 has welcomed some new members recently and we now have 46 on the list with an average of 21 members attending each month. We have enjoyed a variety of venues over the past months including a Fine Dining Experience at Fellows Morton and Clayton. This was a joint venture with Lunch 2 and was most successful. Our meal at the end of May is a new venture being an early evening meal at Latinos in Beeston instead of lunch time and then in July we are trying something new and having afternoon tea at Fintons Bakehouse and Coffee Shop in Breaston. We do rely on members volunteering to organise a meal each month and Glenis and I would like to thank all those who have volunteered and organised some excellent lunches over the past year BUT we are now looking for volunteers from October onwards. If you are new and have never organised a lunch both Glenis and I are willing to give you whatever help and advice you might need. A meeting of both Lunch Groups was held on 17th September to discuss how they should be run in future. It was evident that there was a significant imbalance in group numbers and this was identified as being caused by Lunch Group 1 (LG1) closing their waiting list and putting all new members into Lunch Group 2 (LG2). Consequently, numbers had diminished in LG1 and it was felt an easy way to redress the imbalance would be to refer all new members to LG1 for the foreseeable future. It was agreed to continue running both groups autonomously but to allow members to attend lunches organised by both groups providing places were available. Peter Lyons and Pamela Bayley agreed to have overall responsibility for LG2 and Shirley Cooper and Glenis Fisher will be running LG1. Judging by the numbers present at the meeting it was clear that dining out remains very popular with members so during the coming year LG1 will explore the possibility of an occasional early evening meal, afternoon tea or even going further afield if members are willing to car share. The format of the lunch clubs is that different members volunteer to organise a meal each month so, of course, the success of each group is dependent on its members. Both groups have lunches organised each month into the New Year so do come along to the ‘signing-up’ session, held in the main hall, at the monthly Open Meeting. Details of where and when lunches are taking place will be displayed on the rolling notices. Having run both the lunch clubs with Elizabeth over the past few years we are now handing over to some new group leaders. Shirley Cooper and Glenis Fisher will be organising Lunch Club One while Peter Lyons and Pamela Bayley will be taking over Two Lunch Club. I have really enjoyed running both Lunch clubs and am particularly pleased with helping to set up Two Lunch Club which is thriving with 58 members and meals organised through to Christmas. The original lunch club also continues to do well with a membership of about 50 enjoying a wide variety of restaurants all around Nottingham and Beeston. There have been several suggestions as to new directions which the clubs may take and these will be discussed at an open meeting on 17th September at 10:30 at the Methodist Church, everyone is welcome to attend. On a personal note I think that Lunch Club offers two main things, firstly it allows you to try a range of different types of food in a variety of restaurants which you wouldn’t normally go to. But more importantly, you get to try these foods with some really good company, making new friends and enjoying some lively conversation and fun. 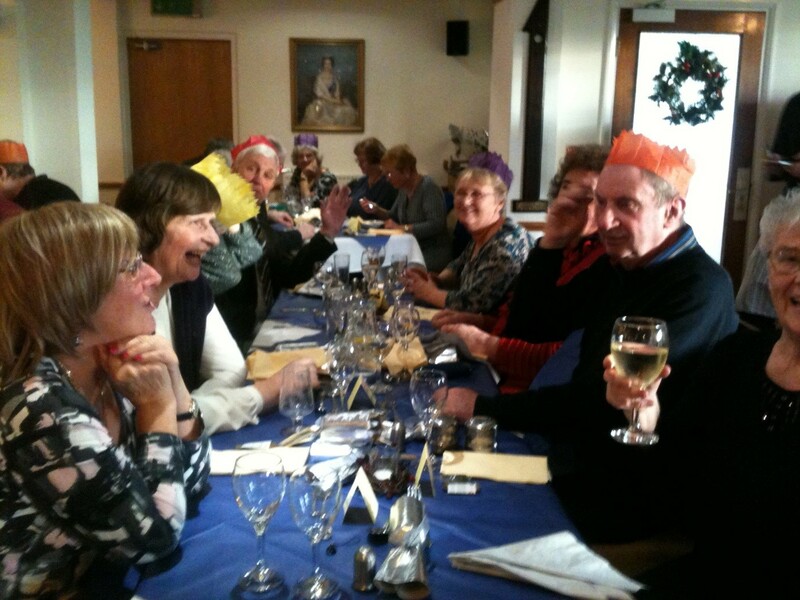 To end the 2014 year both Lunch Clubs had their Christmas meals at different venues. The original Lunch Club had a lovely meal at Hart’s restaurant and our thanks go to Vivienne Morgan and Sheila Bates for their hard work in organising a very successful meal. 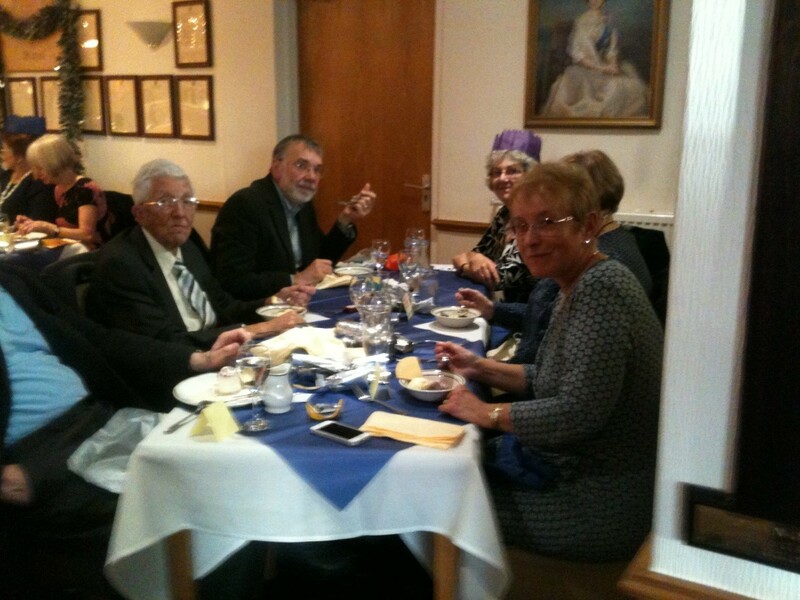 The Two Lunch Club also enjoyed an excellent Christmas meal at Chilwell Golf Club where we had an enjoyable traditional meal with all the trimmings. Our thanks must also go to John and Andrea Shand who, despite only having been in Two Lunch Club for three months, took on the task of organising a very successful Christmas meal. Continuing with the theme of sampling a variety of venues and styles of food, Two Lunch had a great meal at Yannis, which is a popular Greek restaurant in Beeston, and the February meal will be at Sinatra’s – which serves a range of European food. The original Lunch Club went to Le Mistral in Nottingham in January, this is a French style Bistro serving some delicious food in a very warm and friendly atmosphere. They are going to Loch Fine Restaurant which is a seafood restaurant, also in Nottingham. As you can see, a wide range of types of food is experienced so there usually is something to appeal to every taste. If you feel you would like to join us in the future please get in touch with either myself, Margot Gale @ margot.gale@hotmail.co.uk or Elizabeth Le Marchant Brock @ eliz3le2ma1b@btinternet.com as there are still some places available in both lunch clubs. As Christmas swiftly approaches both groups are looking forward to their Christmas meal which tend to be really well attended and a great start to the holiday festivities. Two Lunch Club is going to Chilwell Golf Club on Monday 15th December and Lunch Club One is going to Crème in Stapleford on Tuesday 16th and if anyone wishes to join us they can contact Margot at margot.gale@hotmail.co.uk. 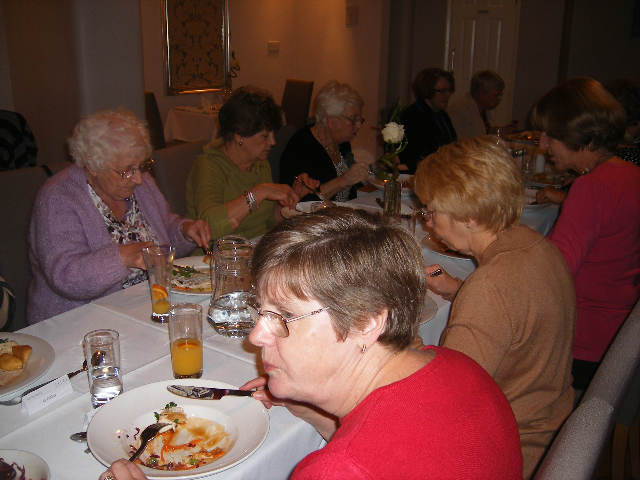 The format of the lunch clubs is that different members volunteer each month to organise a meal for future months. The support from the Lunch Club members is excellent as we have volunteers from both groups to organise meals up to May in the case of Lunch Club One and up to March for Two Lunch Club so it is a case of ‘watch this space’ or rather watch the rolling notices to see where and when these meals will be taking place. As both lunch clubs continue to thrive we have some lovely meals booked for the next two months, at Beeston Fields Golf club in September and Sinatra’s in October. The Two Lunch Club’s meals are still to be arranged but some excellent venues have been suggested, so look out for future meals on the rolling notices at the U3A meeting. The photographs were taken at Bramleys. We have booked a room at the Methodist Church for a joint Lunch Club One and Two Lunch Club meeting on Tuesday 9th September @ 10:00am to revisit the way that the Lunch Clubs work and to look at planning future meals including the one at Christmas. This would be an excellent opportunity for anyone who is interested in joining either group to come along and find out more about how the lunch club works. I look forward to seeing as many of you as can make it at this meeting. Both the original Lunch Club and Two Lunch Club continue to thrive as we now have a total of just over 100 members proving that good food and good company are always a winning formula. Attendance at each meal tends to average around twenty to thirty members depending on the time of year and the venue, some restaurants being more popular than others. This is the strength of Lunch Club, that you can try a wide range of places that you would not normally have thought of going to and often discover some hidden gems. Members continue to organise meals and the Two Lunch Club is going to Mr. Mann’s Chinese Restaurant in July and we are hoping to try the new Table 8 restaurant in Beeston in June – but this has not been confirmed at the time of writing this report. The Original Lunch Club is going to Fothergill’s in June and Bramley’s Brasserie on the University Campus in July. The meals in both groups are organised and booked by the members themselves and it is an indication of their commitment and enthusiasm that meals are now arranged all the way through to May 2014 in both groups. The original Lunch Club is visiting Hart’s, Crème, Adam’s and Aubergine; Two Lunch Club is going to The Hand and Heart, Jamie’s, The White House and Bramley’s Restaurant. There has been quite a lot of movement between the groups as members often attend the other group’s meal and a great example of this joining together was at our Christmas meal which took place at The Larder at Goosegate. Fifty five members attended from both groups and we all had a great time with excellent food and a very festive atmosphere. Having started ‘Two Lunch’ in August this year with an initial membership of twenty three members we have now climbed to a very healthy forty nine members in only four months. 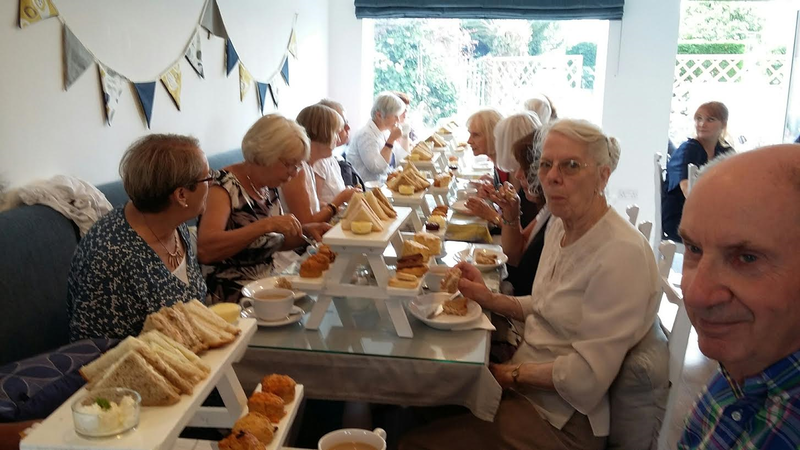 The group has gelled really well and have meals planned at Beeston Fields Golf Club in November and are joining the original Lunch club in December for an exciting meal at The Larder on Goosegate. The original Lunch Club is also thriving and now stands at fifty one members. The November meal is to be at The White Lion in Beeston and we are all looking forward to our first joint Christmas meal where there are still a few places available. The delight of the Lunch Clubs is that you get the opportunity to try a range of restaurants which you may not have thought of going to, in good company with good conversation. There are a few spaces left in the Two Lunch group although if its popularity continues to rise we will soon need to begin a third lunch club!! Since Margot and I took over the running of Lunch Club we have appreciated meals at restaurants as diverse as Mr Mann’s in Wollaton Park and Petit Paris in Nottingham and have been getting to know the members of the group. This month’s outing is to Harts which is being organized by Sylvia Trench and next month Brenda and Arnold are going all Italian at Carlucci’s. We have volunteers for October and November and already Vivienne Morgan is looking into where we will have our Christmas lunch which we hope will be a shared outing with 2 Lunch Club. The new leader is Margot Gale. Email: margot.gale@hotmail.co.uk. The Group Secretary is Elizabeth Le Marchant Brock. Email: eliz3lema1b@btinternet.com. Last week of the month, varying days. Venues local, or accessible by public transport if possible. Arranging lifts should be considered if booking a venue away from a bus route. Members take turns to organise lunches. Priority to lunch club members, spare places at a lunch made available to guests. Members will contribute 10% + towards the tip or, if applicable, a percentage of the service charge. Lunches cost no more than £15 pp, except for special occasions. Diners pay the organisers in cash in the correct amount, both for the deposit and the balance on the day of the lunch. Any additional costs should be paid by the diner themselves direct to the restaurant. There have been several changes since our last newsletter in March, the most significant being that Ann Barry has stepped down as Lunch Club leader after two years of excellent work. 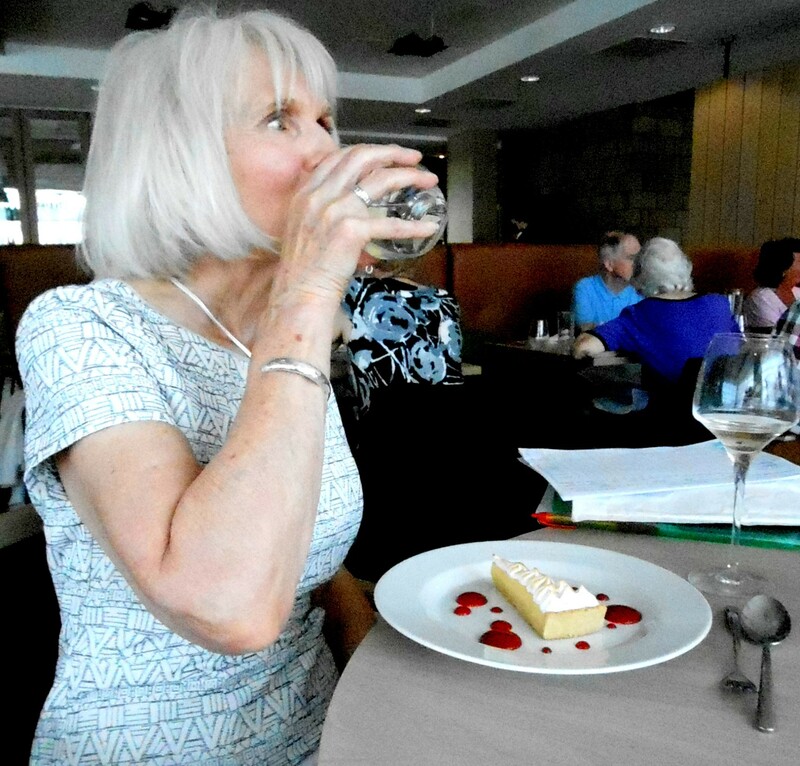 She took up the role as leader when Lunch Club was initially formed and has played a large part in shaping the extremely successful format which Lunch Club follows today. A testimony to how hard Ann has worked is that her single role is now being taken over by two of us, Elizabeth le Marchant Brock and me, Margot Gale. I am delighted to say that Ann will carry on her contact with Lunch Club when family arrangements allow. Another significant event which has happened is that a second lunch club has been formed and this has been targeted mainly at the large number of people who were on the waiting list for the existing Lunch Club, although it is now open to anyone who wishes to join. The initial meeting was on Monday 15th April and it was at this meeting that the name ‘Two Lunch’ was decided for the new group and it was also agreed that the format is to be broadly the same as the existing Lunch Club. Several members volunteered to arrange meals up to August and it is now hoped that other members will feel able to volunteer to arrange future meals. Marianne Taylor is to lead the new group and the first meal is to take place at Yod Siam on Thursday 20th June. Details and signing up for the meal will be at the main U3A meeting on Thursday 6th June. Our April meal was at Aubergine which is a vegetarian restaurant in Nottingham. The food was excellent and carried on the tradition of experiencing new and interesting cuisines. In June we are going to Vivo’s which is an Italian restaurant in Stapleford and July will find us in Mr Mann’s Chinese restaurant, so as you can see, we are travelling the world from the comfort of our U3A Lunch Club! So far this year, at the time of writing, we have had our January lunch at Yod Siam, in Beeston. This proved very popular and was enjoyed by all those who came along. February’s lunch was at the new Greek restaurant in Beeston; Yiannis. In March, we are for the first time trying a venue which is not accessible on public transport; this is the Trent Lock, Lock Lane in Sawley, Long Eaton. We hope that members will be able to arrange their own transport, but will endeavour to help out anyone who can’t. Thank you once again to all our excellent organisers past and present. Members have kindly volunteered to organise lunches as far ahead as August, though we do still have gaps at the moment for April and June. So please, send in your offers and have a go! Lunch club members had asked me to write again to The Hemsley, Nottingham University, regarding our unsatisfactory lunch there last year. You may recall that no response was forthcoming to the letter sent by the organiser of that lunch. Well, I’m sorry to report that I have had the same experience, and my polite letter has not even been acknowledged. So our only recourse is to vote with our feet and not make a return visit. It is unfortunate that the restaurant’s reputation has been diminished by this situation. Finally, this will be my last newsletter article as lunch club leader as I am stepping down after two years. I will continue my U3A membership and also my membership of the lunch club itself. The role will in the future be shared by two of our members who I’m sure will introduce themselves to you in due course. I have really enjoyed the role and have found it a very positive and rewarding experience. So thank you, all you lunch clubbers, and farewell. Since the last newsletter the lunch club has continued to thrive and we have enjoyed meals at Nimboo, Browns, and a repeat visit to Adams. November’s lunch is at Loch Fyne, and December’s Christmas lunch is now at The White House, as we were somewhat let down by The Albert Hall where we were planning to disco-dine. All the organisers have done a great job as usual; the quality of our dining experience is entirely down to them. Over August, lunch club members participated in a survey about the club. The results of the survey were circulated during September and in early October members met to discuss the results and try and address any issues arising. The survey included questions about what they like most or like least about the lunch club. What people overwhelmingly like is trying new food, the good value and trying a variety of places to eat, as well as the social aspect; making new friends and enjoying good company. The things people liked less were more varied, although a good number said they didn’t dislike anything. Some issues, though valid points, were not so easy to change, (such as seating arrangements, large groups, and difficulty in hearing the conversations). Some points made were opposing views, (for example being limited to bus routes versus a preference to do so). At the October meeting we discussed all the points of concern and considered how we could improve them. Members generally felt that the cost of lunches is about right, though some would be prepared to pay more. Responding to questions about their most favourite restaurant, Adams came out top (hence our recent return there, also highly rated). Our least favourite restaurant was The Hemsley, which was so promising and in a lovely location, but was unfortunately let down by the quality of the food. Members had lots of ideas for improvements we could make to the club and these were also addressed at the general meeting. Some we were able to try out; they included ways to reduce the stress of collecting deposits and balances, trying a venue a bit off the beaten track so that lifts will be needed, keeping a reserve list when lunches are fully booked, and having a general meeting every so often. Members also suggested that a précis of the ‘How We Work” document should be devised, and submitted to the U3A website; this has been done. We also agreed to again temporarily increase the membership to 50, to give a chance to people on the waiting list. This is despite some concern about the lunch club getting too large. There are still several people wanting to join the lunch club, so where a member doesn’t attend for four or more consecutive meetings without notifying the leader places continue to be offered to someone else from the waiting list. A full account of the meeting has been circulated to members. The lunch club plan for 2013 is already well under way, thanks to our lovely members who continue to offer to organise lunches on behalf of everyone. Without their efforts, the club could not work at all! Some have even organised two (or even three) lunches, so we do need to ensure that wherever possible, all members do take a turn and share the load. But thanks to everyone for making our club what it is. Following a request to Lunch club members in the last newsletter to plan lunches over the forthcoming months, there was an excellent response and we now have volunteer organisers for every month up to February 2013. In August we are visiting Nimboo, an Indian restaurant in Beeston. Christmas lunch is already planned, this will be at The Albert Hall, Nottingham; and includes a disco! Currently I am conducting a survey of members to ensure that the club is meeting their needs. There have been a very respectable number of responses already, so the views of the majority of members should be represented. The outcome of this will be circulated to members in late September. In line with committee guidance, continuing membership of the lunch club is conditional on regular attendance, so the membership of those who fail to join a lunch for 4 or more months is discontinued. This has meant that at the main U3A meeting in July, we were able to re-open a waiting list for new members. 14 people have signed up so there remains the possibility that a second lunch club could be needed. If anyone is interested in leading a second club, I would be very happy to offer initial help to get things going. The lunch club continues to thrive, and has enjoyed monthly visits to restaurants in and around Nottingham, including ‘Encounters’ and ‘Waltons’. A most eventful occasion was the lunch at ‘Adams’, where a fire alarm meant that everyone was evacuated into the chilly February streets of the Lace Market to await the arrival of the fire brigade. Fortunately the fire was minor and the hungry diners were provided with warming drinks on their eventual return inside. What’s more, apart from the pre-paid deposit, the cost of the meal was then waived! By the end of May, the club will have visited Thailand… (No not really, it’s the ‘Thailand No1’ restaurant, in Nottingham). In June, we will be going to ‘The Hemsley’, a high class eatery in the grounds of Nottingham University. Would members please note that in order to obtain the best possible price, this lunch will now take place on Wednesday 27th June, rather than Monday 25th as previously planned. Our July lunch is a real treat, as we will be cruising along the Trent as we dine, on the ‘Princess’ riverboat. Once again, a very big thank you and well done to all those members who have organised lunches on behalf of the group, some for the second or third time. The number of members has not reduced very much, so we are not yet in a position to open up for new members. But on a positive note we have been able to offer places at each and every lunch to all those in the lunch club wanting to book, and where there have been spare places have been able to offer these to non members. Rather than organise a general meeting to ask for volunteer lunch organisers for August onwards, I ask that lunch club members contact me directly to put themselves forward for our monthly dining calendar. At this stage, only the offer of the month is needed, the venue can be arranged nearer the time. I do feel that the club has settled into an effective mode of operation and is working well, and that should any issues arise requiring a group discussion, this can be arranged over a pre or post lunch coffee. I also propose to reissue the club ‘ground rules’ as agreed at our earlier meetings. Any feedback or comments are welcome. In March, representatives of the Beeston and Long Eaton U3As were invited to the official launch of Cafe 100. Sat Bains (a local celebrity chef) cut the ribbon on the day. He also led the famous Saturday Kitchen ‘Omelette challenge’. Cafe 100 is hospitality & catering training academy for young people aged 14-19 and will be used to train people for careers in the hospitality industry, giving them a head start when seeking employment. The idea is to give disadvantaged young people an opportunity to work alongside the café’s manager and head trainer. Trainees will play a large part in managing and running the café, learning about how to operate a business, as well as developing the skills needed to work in the catering industry. It is also a community cafe which is open to the general public. Cafe 100 provides a range of community learning and engagement activities, such as themed clubs and workshops, completely staffed and run by the trainees. They hope that the local community will develop the cafe to suit their needs, and that the cafe can provide affordable locally sourced food and beverages. The café is available to hold group meetings, or just for a coffee and cake or a spot of lunch. Café 100 is open to the general public on Thursdays & Fridays from 9am to 3.30pm and hopes to soon be open 5 days a week. The address is 100 Derby Road, Long Eaton, NG10 4LS and is situated on the left-hand side of the main Derby Rd heading into Long Eaton (opposite Kam services garage), on the main Indigo bus route towards Derby. 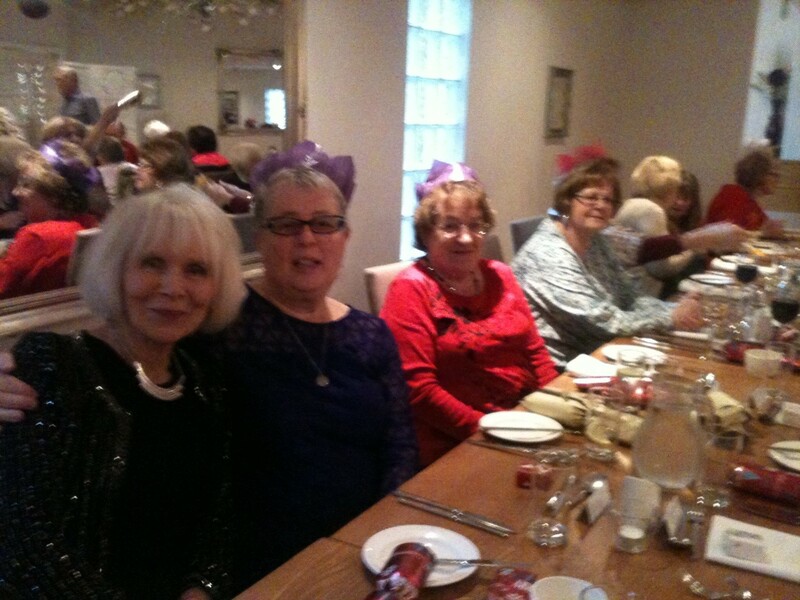 After a wonderful Christmas lunch at ‘The White House’, Sawley, the lunch club January meal was held at ‘Le Mistral’, in Nottingham. As this became fully booked up, other members organised two alternative lunches. This meant that all members who wished to did have the chance to come along to a meal. A big thank you to all those who organised these lunches, they were very much appreciated. By the time this goes to print we will have sampled ‘Adams’, at New College Nottingham, in March we will be going to ‘Encounters’, and in April we are looking forward to lunch at ‘The Walton Hotel’. We have dates and organisers for May and June, and watch this space for a very exciting and different event for our July lunch! After the December general meeting of the lunch club, all those on the waiting list were added to the club membership, and names of those who had not attended a lunch or a meeting for four or more months were removed from the list of members. Despite this, we still have a very large membership and a decision was taken to not maintain a waiting list until the group has reduced in size. It is hoped to be able to reintroduce a waiting list in the future, and this will then be announced at a main U3A meeting. Another decision taken was to move lunches to the 4th week each month, in order to minimise clashing with other groups. We continue to ask for a £5 deposit on booking, and agreed that tipping at 10% should be the norm where we are happy with the service. Members were happy to retain a maximum cost of £10-£15 per meal, and to book restaurants in areas accessible by public transport. 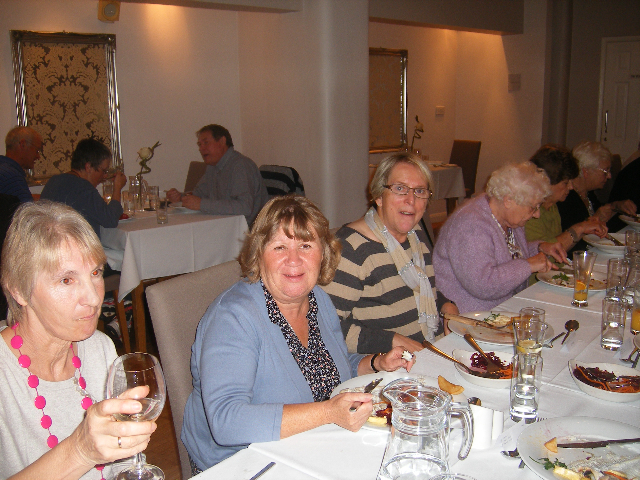 As we approach our first complete year of the Beeston U3A lunch club, we can look back with a sense of satisfaction that the group has achieved what it set out to do; that is to meet new friends and enjoy a tasty food in a range of different restaurants. In fact the only problem we seem to have is that the club is just too popular! The Lunch Club is about to have not only the final lunch of the year; it is also the last of the lunch dates arranged at our inaugural meeting. We have come such a long way since that time and tasted some delicious meals, but also we have very much enjoyed getting to know one another. It has been a chance for those responsible for choosing and booking the restaurants to demonstrate their organisational, communication and financial skills. Without exception, the lunch organisers have done an excellent job, and many thanks go to them for all their hard work. Hopefully members will have many ideas for different and exciting places to try out next year. On Monday, 5th December, the club is meeting from 10 a.m. to 11.30 a.m. in the Guild room at the Methodist Church to evaluate how things have gone so far and to plan for the next phase. We hope that as many members as possible come along to help with the decision-making, and in this way play a real part in how we move forward. The proposal to hold a monthly coffee morning will be included on the agenda. After a slow start, there are now 19 people already signed up for this, so it looks likely to go ahead, possibly starting in January. We especially want to find a way to include those U3A members who are still on the Lunch Club waiting list to be moved on to the main membership list, and we are determined to find a way to do that. Ideas on how best to do this will be welcome. On that note, all of us involved in the lunch club can look forward to many interesting social occasions in 2012, and wish all our U3A friends a very Happy Christmas and a wonderful New Year.